The story is set in a dystopian near future where there’s another civil war in the United States. Manhattan has become a no-man’s land of sorts with a newbie reporter dropped in through no fault of his own. No reason to tell the whole story here. Take a look at the back cover. Hard to read it in the photo above, but you can get the idea. I must say, the storytelling excels. The art is impressive, too. You’ll follow a character who’s interesting, who meets other characters worth your time, and ultimately come away with a few questions. The good news is the series went 72 issues. So, there’s plenty more to read. Enjoy every page. I’ve written several feature film scripts. Most of them were not so good. Finally, I created a story that is quite pleasing to my story telling sensibility. The title is Dog & Kat. 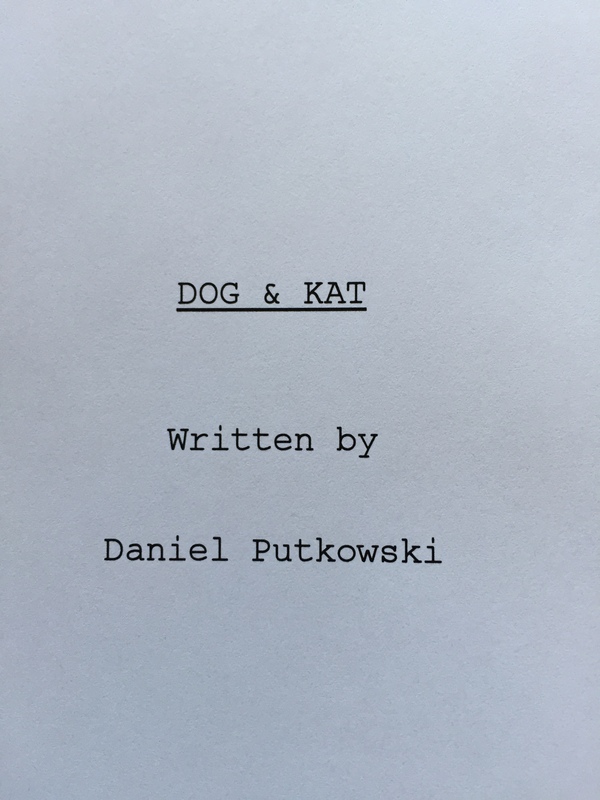 Title page from the screenplay, Dog & Kat. It’s about a young junkyard mechanic who lives a miserable existence. He falls for a woman with a past, someone who shows up in the middle of the night and takes his supper, namely Katrina. What a way to start a relationship! Dog is not easily deterred. He knows what he wants when he sees it, and is willing to do whatever it takes. His determination makes him worthy, but also vulnerable, as Katrina may or may not be manipulating him for her own purposes. I’ll be posting regularly here on The Bent Page as the project moves forward. Funding is in place, pre-production is under way, and it will surely be a wild ride to a finished film. Check back often for updates. Back in August, I submitted a video to the Flights, Camera, Action contest sponsored by American Airlines. The objective was to talk about a trip that changed your business. Well, it was way back in 1994 that I took my first American Airlines flight to Aruba and that journey changed my business career in the most dramatic way. As it turns out, my video is a finalist in this competition and I humbly ask for your vote to make it a winner. Follow this link, watch my video (for Hawser Press) and VOTE. By voting, you’ll also be eligible for 25,000 frequent flier miles, which is a nice perk. I hope you enjoyed the video. Thanks for your support and safe travels!